Post attendee URL can be used to redirect users to your organization's website after they leave the Zoom meeting or webinar. It directs users to a specific page to have participants provide follow-up information or get more information. You can designate a post attendee URL for all meetings on your account, a default URL for all webinars on your account, and also change the post attendee URL on a webinar by webinar basis. For webinars, you can also set a Post Webinar Survey to open in a new tab or window for attendees at the end of the webinar. This is set on a webinar by webinar basis. Learn more about how to set a post webinar survey. For a user to be redirected to the post attendee URL, they need to join the meeting or webinar by clicking the join link and leave the launching page open in their browser. When a user clicks the join link for a meeting or webinar, it will launch a window in their default browser. If the user already has Zoom installed on their computer, it should open automatically and join them into the meeting or webinar. If Zoom is not detected on their computer, it will download automatically. If the user leaves the launching page open in their browser, it will redirect to the post attendee URL after 5 minutes. As an account owner or admin, you can set a post attendee URL for all meetings held by any user on your account. To do this, you need to have a vanity URL approved for your account and access to the branding page. Users will not be able to set their own post attendee URL for meetings. Login to the Zoom web portal and navigate to Branding. Click the Meetings and Webinars tab. In the Meeting Post Attendee URL field, enter in the URL that you would like users redirected to. As an account owner or admin, you can set the default post attendee URL for all webinars held by any user on your account. The host of the webinar will have the ability to change the post attendee URL to a page of their choice within the individual webinar settings. 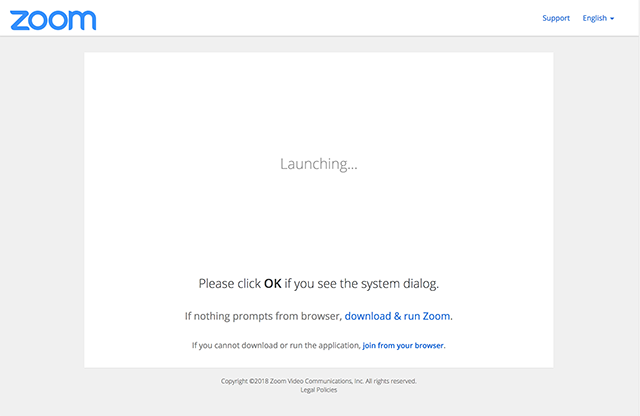 Login to the Zoom web portal and navigate to Webinar Settings. Next to Post Attendee URL, click Edit. Enter the URL that you would like users redirected to. Login to the Zoom web portal and navigate to My Webinars. Click on the topic of the webinar that you would like to set the post attendee URL for. Scroll down and click the Branding tab. Enter the URL that you want attendees redirected to.